Ice Fire FLEECE Figure Skating Pants - Pair of Skates. 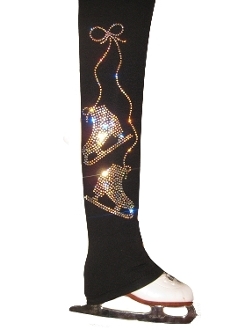 Ice Fire Figure Skating Pants are made with power stretch polartec fleece and feature a "pair of Skates" crystal design down one leg. Crystal design is made with more than 500 pieces of high quality czech AB crystals. Warm and stretchy these ice skating pants are great for the cold climate at the ice skating rink. Choose from several colors in Child XS - Adult L. Click on images to view crystal color choices and sizing chart.